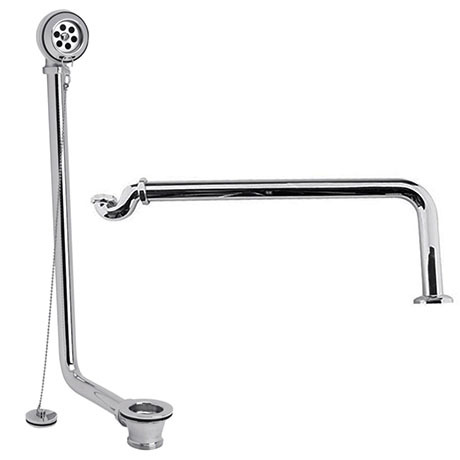 Hudson Reed Exposed Bath Drainage Kit - Chrome Plated Brass Bath Waste and Overflow Kit. Complete with chrome waste, chrome overflow, chrome plug and chain, chrome trap and chrome outlet pipe. Hudson Reed Specialist bathroom accessories provide timeless design and excellent value for money. This gorgeous product from Hudson Reed is designed to be used on free standing baths and be exposed. The Hudson Reed Luxury Exposed Chrome Bath Retainer Waste is a throwback to traditional designed pipe work. Using latest manufacturing methods to ensure high quality products. Q. Will this fit the Burlington Hampton Showering Bath? Hi, yes this should work fine. You may need to trim the pipe down slightly. I hope this is of some help! Q. Can the waste after the trap be shortened? And how does the waste attach to existing pipework? I have a 40mm pipe sticking out of the floor ad a fixed position (can't be moved) and as the floor is tiled I can't access underneath either. Was hoping for a compression fitting onto the existing pipework, but from the pictures this looks different. Thanks. Q. will this fit a roll top bath with a base thicknes of 30mm? Hi Phil. We would not recommend this item as it is only suitable for baths up to 20mm thick. The kit arrived the next working day as promised and was a perfect fit. It looks and feels sturdy and gives the free standing bath a luxury completed look.